Should Automobile Fuel Economy Standards be Tightened? This paper develops analytical and numerical models to explain and estimate the welfare effects of raising Corporate Average Fuel Economy (CAFE) standards for new passenger vehicles. The analysis encompasses a wide range of scenarios concerning consumers valuation of fuel economy and the full economic costs of adopting fuel-saving technologies. It also accounts for, and improves estimates of, CAFE's impact on externalities from local and global pollution, oil dependence, traffic congestion and accidents. The bottom line is that it is difficult to make an airtight case either for or against tightening CAFE on pure efficiency grounds, as the magnitude and direction of the welfare change varies across different, plausible scenarios. The analysis explains how previous oil shocks have affected real U.S. income. Real income differs from aggregate economic output (GDP) because it includes the purchasing power losses associated with more expensive imported petroleum. Real income declines immediately during the same quarter as the oil price shock as opposed to the output effects, which are lagged over several quarters. These immediate losses can be significant, reaching as much as 1.7% of the baseline value in the same quarter, for a doubling of crude oil prices. Expanding coverage to include purchasing power losses allows policy analysts to evaluate a range of different policy instruments that can influence oil prices, such as the building and release of the strategic petroleum reserve. Restructuring efforts in the U.S. electric power sector have tried to encourage transmission investment by independent (non-utility) transmission companies, and have promoted various levels of market-based transmission investment. Underlying this shift to �merchant� transmission investment is an assumption that new transmission infrastructure can be classified as providing a congestion-relief benefit or a reliability benefit. In this paper, we demonstrate that this assumption is largely incorrect for meshed interconnections such as electric power networks. We focus on a particular network topology known as the Wheatstone network to show how congestion and reliability can represent tradeoffs. Lines that cause congestion may be justified on reliability grounds. We decompose the congestion and reliability effects of a given network alteration, and demonstrate their dependence through simulations on a 118bus test network. The true relationship between congestion and reliability depends critically on identifying the relevant range of demand for evaluating any network externalities. Power generation firms confront impending replacement of an aging coal-fired fleet in a business environment characterized by volatile natural gas prices and uncertain carbon regulation. We develop a stochastic dynamic programming model of firm investment decisions that minimizes the expected present value of future power generation costs under uncertain natural gas and carbon prices. We explore the implications of regulatory uncertainty on generation technology choice and the optimal timing of investment, and assess the implications of these choices for regulators. We find that interaction of regulatory uncertainty with irreversible investment always raises the social cost of carbon abatement. 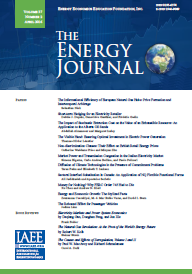 Further, the social cost of regulatory uncertainty is strongly dependent on the relative competitiveness of IGCC plants, for which the cost of later carbon capture retrofits is comparatively small, and on the firm�s ability to use investments in natural gas generation as a transitional strategy to manage carbon regulation uncertainty. Without highly competitive IGCC or low gas prices, regulatory uncertainty can increase the expected social cost of reducing emissions by 40 to 60%. We consider some unintended effects of a technology treaty to increase the (stochastic) possibility of developing an energy alternative to fossil fuels which, when available, makes fossil fuels redundant. One implication of such a treaty is to increase the incentives for fossil-fuels producers to extract fossil fuels existing in given quantity more rapidly, under competition when the equilibrium price path for fossil fuels follows Hotelling�s rule. When the treaty may result in the new technology being immediately available, the expected resource extraction path is accelerated for an initial period, in simulations for 510 years, despite fossil fuels being phased out when the new technology appears. When there is a minimum (10-year) lag from treaty signing to technology implementation, expected extraction is speeded up for a longer period, 12-15 years. We discuss the implications of such treaties for global carbon emissions, which are not necessarily positive. The speed of vehicle ownership expansion in emerging market and developing countries has important implications for transport and environmental policies, as well as the global oil market. The literature remains divided on the issue of whether the vehicle ownership rates will ever catch up to the levels common in the advanced economies. This paper contributes to the debate by building a model that explicitly models the vehicle saturation level as a function of observable country characteristics: urbanization and population density. Our model is estimated on the basis of pooled time-series (1960-2002) and cross-section data for 45 countries that include 75 percent of the world�s population. We project that the total vehicle stock will increase from about 800 million in 2002 to more than two billion units in 2030. By this time, 56% of the world�s vehicles will be owned by non-OECD countries, compared with 24% in 2002. In particular, China�s vehicle stock will increase nearly twenty-fold, to 390 million in 2030. This fast speed of vehicle ownership expansion implies rapid growth in oil demand.